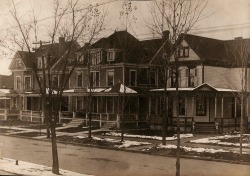 The middle house, 205 Furman Street, in Syracuse, is the family home that Mary sold in December 1909 for approximately $5,000. The same day that Mary was paid in cash by the buyer of the house, she reported to the Syracuse police that the money was lost or stolen while on a Christmas shopping spree. 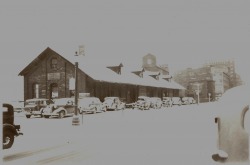 Packing house on Clinton Street, owned by Frank Jones. This picture was taken a long time after Frank Jones' death in 1909, and is now occupied by subsidized housing. 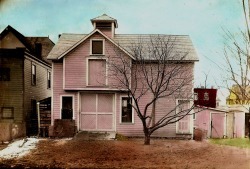 Jamesville slaughter house that brothers Frank and Howard Jones purchased from the mother after their father's death. Surrogate Edgar Glass ruled the transfer fraudlent and the brothers were forced to relinguish the deed. 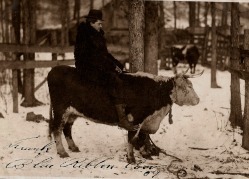 Frank and Mary's son Frank with uncle Charles, on their way to the packing house, probably from the Jamesville slaughter house. Frank and uncle George with a wagon of meat on their way to the packing house, downtown Syracuse. 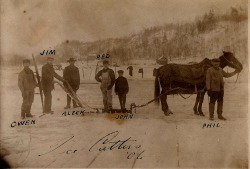 The 1909 appraisal of Frank Jones' estate inlcuded an ice house attached to the Jamesville slaughter house - I'm assuming the gentlemen in this 1907 photo are cutting ice for the Jones meat business. 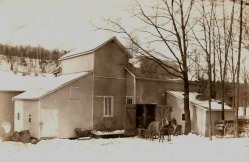 Blue ribbon cow, 1909, at the Jamesville slaughter house or the East Syracuse farm. 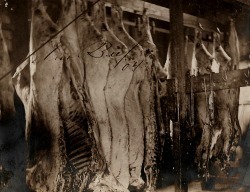 Dressed beef hanging at either the Jamesville slaughter house or the downtown Syracuse packing house on Clinton Street.